A monumental moron decided to go for a drive on I-526 while securing a mattress to the top of his car with only one hand. Danny Vaughn had just purchased a $600 queen-sized mattress and couldn’t be bothered to wait for it to be tied down to his car, so he can put everyone’s life in danger to get home a few seconds earlier. 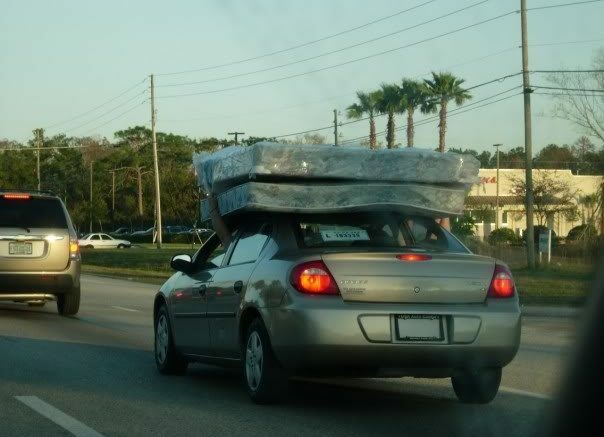 Danny merged his mattress-covered car onto I-526 and initiated his safety precautions, which consisted of putting his hazard lights on and reducing his speed by 5 MPH. Fellow commuters did their best to race past Danny’s car before his mattress went airborne, offering extended middle fingers as they went by. 3 Comments on "Idiot Holding Mattress On Top Of Car With His Hand Goes For Drive on I-526"
I’ve seen this guy on Ashley Phosphate Road! Looks like the mattress came with a new car. Columbus day sale?